We hurriedly went to the ticketing counter of Marina Bay Sands SkyPark Observation Deck. I was worried back then because it was almost 9pm and I thought we're not going to make it. Marina Bay is a huge hotel, you only have to ask the hotel personnel if you're lost. We spotted some Filipinos working in the hotel which was a happy thing. Masaya talaga makakita ng kababayan (kahit di ako ofw). 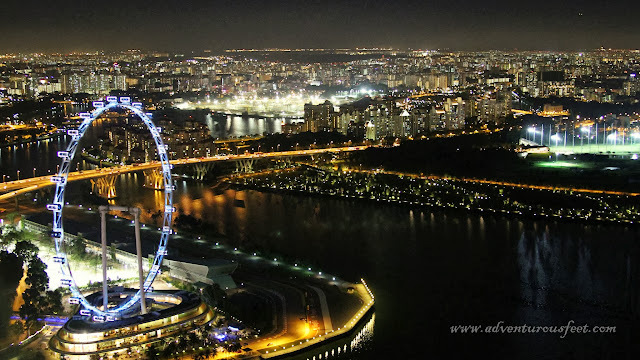 To get a good view of the city, SkyPark Observation Deck is a great area to enjoy the night. I somehow felt bad that tripods are not allowed, maybe because it is too windy up here and for safety reasons they don't want to risk it. 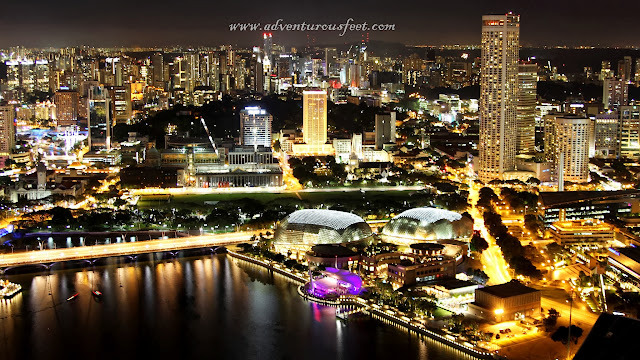 The SkyPark observation deck is located at the 56th floor while The Club at Marina Bay Sands is located at 57th. As usual I was busy taking pictures, I hope I was able to get some nice shots to justify how cool it is to be at the top. Great view right? Oh I love Singapore! After enjoying a stunning view of the city, I wanted to see a famous bridge in Singapore called The Helix Bridge. This requires a lot of walk from Marina Bay Sands but we didn't mind as we pass by The Shoppes at Marina Bay, a luxurious shopping mall in Marina Bay Sands Singapore. This is an interesting piece, you speak at the end, and the other end will hear you. Talk about sound waves. Upon exit at The Shoppes at Marina Bay Sands, Jason was a bit tired from walking since morning. I asked him to sit down for few minutes, while I take some photos again. Walang kapaguran! Another one as we walked by to see Helix Bridge. It was almost 10:40pm when we reached Helix Bridge. I love Helix Bridge very much. But unfortunately after taking few photos of ourselves, around 11pm the lights went off, argh! I'll be back Helix Bridge, I have to see you again! Thanks for sharing. Will be travelling with my kids to Singapore in December. Any tips?